For years, Chevrolet showrooms have been missing a true off-roader. Yes, the carmaker has thrown Z71 off-road suspensions on Tahoes, Suburbans, and Silverados, but the manufacturer hasn't truly gotten into the nitty-gritty of off-roading...until now. Is the new Colorado ZR2's existence due to the hype of the Ford F-150 Raptor, or something else? That's a question GM will probably never answer—but who really cares, because the ZR2 is in a class of its own. The redesigned (underneath the skin, at least) Colorado ZR2 is the perfect example of what can happen when engineers get together and build a truly fun truck. Combining a base Colorado's body and the underpinnings of a true off-roader, the Colorado ZR2 is a winning combination of practicality and fun. Plus, we were able to squeeze out 26 miles per gallon on the highway when driving the Duramax diesel version. Before launching into the Colorado ZR2 driving experience, it's important to go over a few details about how the truck is made. 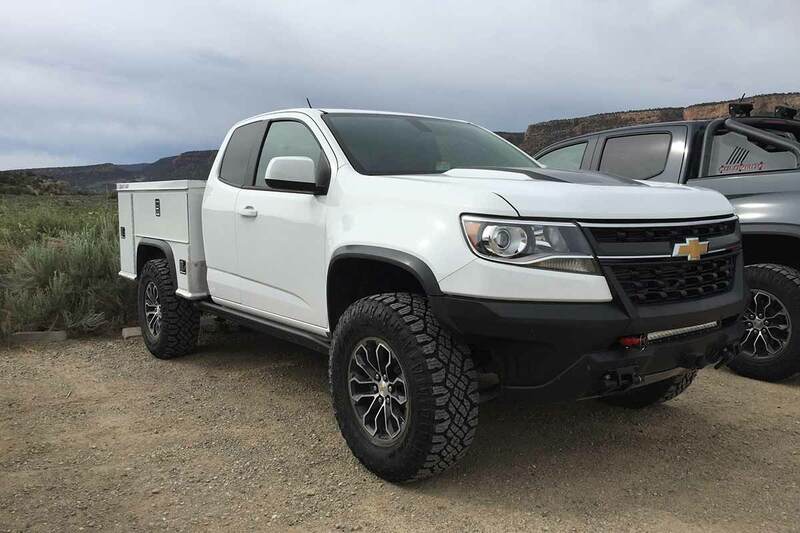 The Colorado ZR2 is loads different from Chevy's regular mid-sized truck beneath the skin; compared with the stock Colorado, it has a reenforced frame, a 2-inch lift, a 3.5-inch-wider track, deleted bumpers, repositioned suspension anchor points, front and rear-locking differentials, DSSV suspension, and rocker rails. Translate that to Gateway Canyon Resort's baja track, as GM had your author do during the inaugural press drive, and the truck leaves you grinning ear-to-ear. When the rear differential is locked, traction control is deactivated and off-road mode is engaged, leaving you with a pure, predictable desert runner. 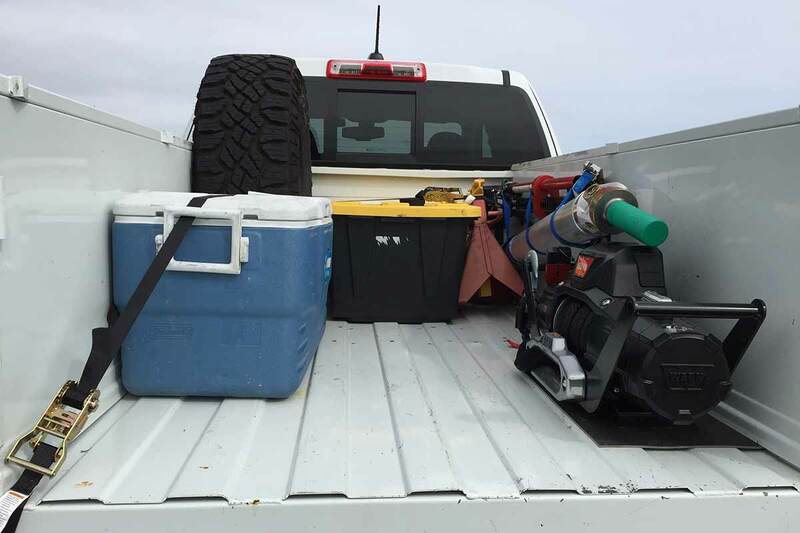 Although many journalists on the press trip preferred the 3.6-liter V-6 during the high-speed offroad course, I found the 2.8-liter Duramax diesel to be perfectly sufficient if you kept the turbo spooled. When venturing the rough off-road trails of Colorado, the Duramax really began to shine. With a low crawl ratio of 36.42 and a relatively smooth torque curve, the truck hopped over any obstacle in its way, including the Tabegauche Trail "playground" in Bangs Canyon, Colorado. Unfortunately, it is hard to truly compare the Colorado ZR2 to another pickup ,as it varies drastically in size and configuration from anything else. The Toyota Tacoma TRD Pro and Ford F-150 Raptor are the closest competitors, but neither are in the same "class," as the TRD Pro is still a gussied-up Tacoma and the Ford F-150 Raptor is significantly bigger, more powerful and more expensive. Still, I'll harp on how the ZR2 compares to these two vehicles just to give the reader some perspective. There are plenty of people out there who want to dabble in the off-road world, but don't want to be left with a massive pickup. With the 2017 Chevrolet Colorado ZR2, the fear of having to choose between size and off-road capability is seemingly wiped out. Right off the bat, you notice the Colorado ZR2 is 7.2 inches shorter in length and 12 inches thinner than the Ford F-150 Raptor. Plus, the Colorado ZR2 is 6.3 inches shorter in height. But the smaller footprint of the Colorado ZR2 does not make it any less off-road capable than the Raptor. Sure, the Raptor has 450 horsepower coming from a high-output 3.5-liter twin-turbocharged EcoBoost engine, but the 308-horsepower 3.6-liter V-6 or 369 lb-ft of torque coming from the 2.8-liter turbo diesel give the ZR2 all the power it needs. The Colorado ZR2 is loaded to the gills with advanced and class-exclusive technologies, most notably the Multimatic's Dynamic Suspension Spool Valve (DSSV) suspension taking from Formula 1 and the Camaro ZL1. This advanced multi-chamber suspension system quickly adapts to varying terrain conditions for optimal performance. I had the privilege of driving the Colorado ZR2 both on the Bangs Canyon Trail in Colorado and the urban and suburban areas in and around New York City. When driving through the mean streets of Brooklyn and Westchester, we noticed one thing right away, the Colorado ZR2 didn't float around as you would expect from a truck rocking a 2-inch lift and big tires. 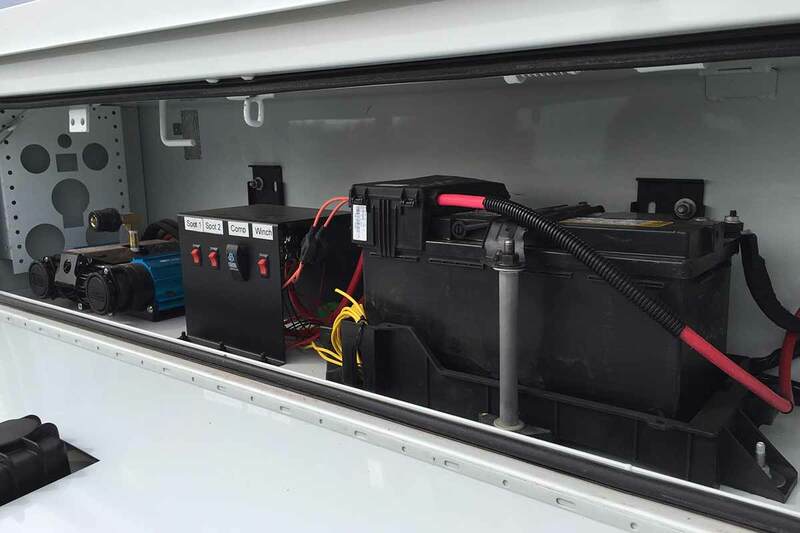 The DSSV system remained tight and well-controlled through every on-road maneuver. The Colorado ZR2 remained level through corners, never showing symptoms of the off-road capabilities that lay below the body. When the truck hit a bump at highway speeds, it absorbed the impact quickly, and the vehicle would return to center travel without bouncing around for the next two verses of whatever song was on the radio. Expecting a lot of road noise from the rockers, lift, knobby tires, and general truck dimensions, we were pleasantly surprised to feel civilized behind the wheel of the Colorado ZR2. Whether rocking the 2.8-liter Duramax diesel (tested in Colorado) or the 3.6-liter V-6 (tested in New York), the cabin was always quiet and void of rattles. This may seem like a relatively minor item, but it is more important than you think. When you own a off-road-ready truck like the Ford F-150 Raptor or Ram Rebel (which is debatably not in the same league), you're constantly aware you're driving something designed to conquer the dirt, sand, rocks, and mud. The suspension travel leaves you bouncing around and the big tires leave a humming sound in your head long after you trip is done. Thanks to sound-deadening materials and a solid tire choice of 31-inch Goodyear Duratrac off-road rubber, the Colorado ZR2 only reminds you that it's off-road-ready when you see the slight bulge in the hood or the locking differential switches on the center console. In order to easily navigate advanced off-road trails, Chevy performed serious front and rear bumper modification for improved approach and departure angles. The Colorado ZR2 boasts a 30-degree approach angle and 23.5-degree departure angle. Another dimension of note is the 8.9 inches of ground clearance; this might not seem insane, but it's measured from the base of the rear suspension (the lowest point of the truck). Instead of measuring from the rear differential or another, higher point, Chevy opted to promote the true ground clearance—something certain manufacturers shy away from. Every inch of the Colorado ZR2 is designed so you don't have to worry about your truck when taking it off-road. The front bumpers are cut away in front of the wheel for improved articulation, the rear bumper steps are deleted to prevent unnecessary repairs when they are crushed, the truck's vital parts are protected with 4mm aluminum skid plates up front, and the bumper flares are easily removable or replaceable. A real difference between the Ford F-150 Raptor and the Colorado ZR2 is the suspension travel. Smaller in stature, the Colorado ZR2 has less travel, with 8.6 inches in the front and 10 inches in the rear. In most circumstances, the DSSV system is able to work fine without maxing out the suspension travel, but I found myself lifting a tire every so often when traversing uneven natural stairs or during even mild bouldering. In comparison, the Raptor's 13 inches of travel up front and 13.9 inches of travel in the rear make a noticeable difference. The cockpit is a little snug. If you are a well-fed or naturally large individual, the Colorado will definitely be a reality check compared to the larger Silverado. Shoulder room up front is 57.5 inches, compared to the Silverado's 66.7 inches. Likewise, if you are smaller in stature or have bad knees, the Colorado ZR2 is a little hard to get in to. The Colorado ZR2 sits on a 2-inch lift with 31-inch tires, so the absence of running boards can get annoying. That being said, it wouldn't make too much sense to have them if you wanted to take advantage of the the frame-mounted rockers and other rock-crawling features. The Colorado ZR2 does not have backup sensors. Yes, the Colorado ZR2 is a relatively small truck, but it would still be nice to have these as an option. The Colorado ZR2 is an amazing engineering accomplishment for Chevrolet, and a true pleasure to drive. Like any vehicle, the Colorado ZR2 has flaws, but we struggled to find them even with a critical eye. Both the 2.8-liter turbo diesel and 3.6-liter V-6 provide plenty of power and capability. If the turbo stayed spooled throughout Chevy's Baja-like track in Colorado, I was able to keep the Colorado plowing along with ease. And taking the diesel onto the slow trails was blissful. You could just take your foot off the gas and crawl for days, thanks to well-chosen gearing and smooth turbodiesel torque. Transferring our attention to the 308 horsepower V-6, we found the truck to be quick on the street and powerful enough to handle any obstacle with relative grace. The only time I found the vehicle to lack power was when it was choking for oxygen at higher elevations. If you're out to find a vehicle you can daily-drive on city streets and then take on serious off-roading trails on the weekend, the Colorado ZR2 is your best bet. The Toyota Tacoma may have a rear-locking differential, but it leaves you feeling like your insides are being pulped when driving on pavement. Even when you are off-roading, the Tacoma Pro only offers an additional inch of suspension travel over the conventional Tacoma TRD Sport. The Ford F-150 Raptor, on the other hand, may be more capable at hitting a jump at 60 mph, but it is larger than your conventional F-150 (which is already large) and an absolute boat on the road or in the parking lot. Long story short, the Colorado ZR2 is the happy medium off-road truck buyers were craving—without a sense of compromise. Random fact of your choosing: Somehow got around 26 mpg on the highway without trying that hard. A side note: We felt we would be doing you a disservice if we didn't share images of the Chevy Colorado ZR2 chase truck Gm brought along for the off-roading session with you.